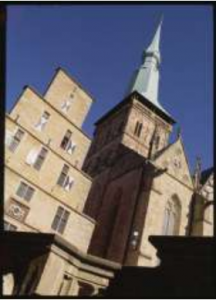 18.05.2013 – Historical city tour through Osnabrück and Maiwoche visit – ENTDECKE! – DISCOVER! Welcome to Osnabrück the City of Peace! Osnabrück, the third largest city in Lower Saxony is known worldwide as the city of peace. In 1648 the negotiations of the Treaty of Westphalia took place here, the signing of which ended the 30-year war in Europe. Osnabrück is also the birthplace of Erich Maria Remarque, one of the most important German writers. He is one of the most important humanists and anti-war writers of the 20th Century. Another artist, whose hometown was also Osnabrück, is Felix Nussbaum. Like no other painter of the first half of the century, Felix Nussbaum has captured in his paintings all the events of the decades following the First World War. 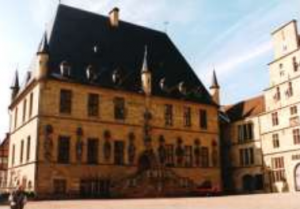 By taking a historical tour through Osnabrück you will get the opportunity to discover and experience the fascinating history of the Peace of Westphalia, as well as the city itself. You are also cordially invited to visit Osnabrück’s renowned May week. The May week is one of the largest open-air events in northern Germany and takes place in the city centre of Osnabrück. This festival offers music for all tastes. On more than ten stages a 12-day music and show program with over 120 bands and performers offers something for everyone. The May week with all its highlights not only enthuses the people of Osnabrück, but is also known far beyond the regional borders.